You probably already are familiar with the picture of a Christ statue deep under the sea and you are asking yourself where it can be found. The answer to that question is not even that straightforward as you might think as there exist more undersea statues of Christ named Christ of the Abyss scattered around the earth. The original Christ of the Abyss is immersed in the waters of San Fruttuoso, not far from the worldwide renowned village of Portofino. Located more than 15 meters deep under the sea, the bronze statue was placed on the seabed on the 22nd of August, 1954, at the initiative of legendary Italian diver Duilio Marcante, who wanted to place a statue of Jesus following the death of his friend Dario Gonzatti, which occurred during a dive a few years earlier in that spot. The statue was created by sculptor Guido Galletti, and its arms are raised upwards as a sign of invocation. The sculpture is 2,5 meters high and it weighs 260 kg’s without the foundation. Following the death of Marcante was placed a plaque on the base of the statue in his memory. It has been recently restored to preserve it from corrosion and fouling and to reattach the hand that had been detached by an anchor. 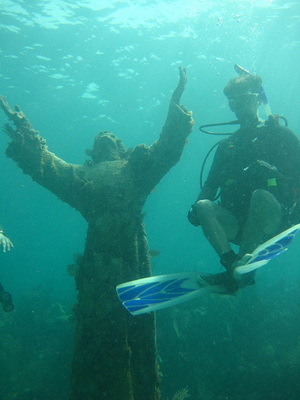 The Christ of the Abyss has become a tourist destination for scuba divers around the world. In the village of San Fruttuoso there are plenty of diving centers that organize dives for tourists eager to see the statue. The dive in the area where the Christ of the Abyss is located is not particularly difficult due to the shallow water and because of the proximity to the bay. And if you choose to submerge into the sea, in this spot you will not only find the statue you are looking for, but also the remains of a British ship that sank not far from that spot during the Crimean War. If you happen to be in San Fruttuoso on the last Saturday of July, you will be able to participate in a local ceremony that includes the blessing of the sea and lighting of candles along the bay. As said earlier, the original statue is not the only one that you can find. 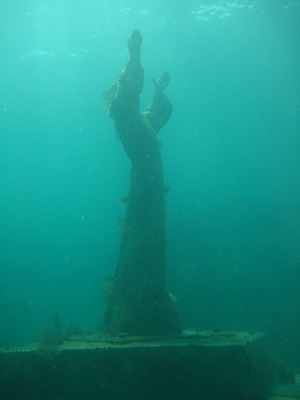 There are copies of Christ of the Abyss both under the sea and above it, the most popular one being found in the United States, next to Key Largo, FL. For a list of places you can see the statue head over to our page dedicated to keep a track on the worldwide locations.